Today we welcome Diana for an interview! Thank you for having me to your wonderful blog. I’m happy to be here. These are great questions. In elementary school I wanted to be a spy. I wanted to be like Harriet the Spy, but work for the government like James Bond. I liked the mystery and the sneaking around and I have always liked watching people. I used to peek in windows, watching how my neighbors lived their lives and make up stories about them. I think it was a lot like writing -- but now I don’t worry about getting caught. I start with a character – back to being a spy. I will see an interesting person – I’m always watching people in the grocery store or on the street -- and wonder what his/her life is like. That starts a story. I like to write in the morning. Ideally, I would plug my computer into my head before I even got out of bed. That is my most creative time. Would someone please invent that computer attachment? I have a husband, two big dogs, and two big kids, so it’s hard. I’ve had to teach myself to say “no” to fun things like going out to brunch or on a hike. I have to be protective of my time. But learning to saying no has been great for things I don’t want to do. I can say I’m too busy writing to clean my house or do the laundry. I think a great story is about a character who wants something and has all kinds of conflicts to getting it. It’s as simple as that. I always get half way through and think it stinks and I should be writing something else. Even though it happens every time and I know it’s going to happen, I still spend a few days upset and anxious and ready to throw a year’s worth of work away. I’ve written six books. 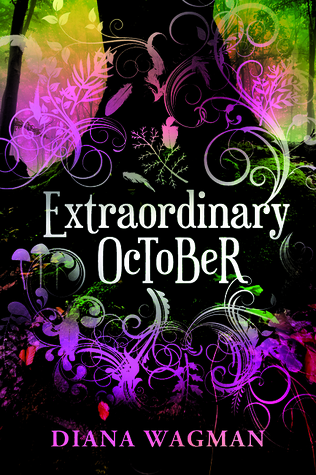 Extraordinary October is my first for young adults. I really loved writing this book. It was so much fun. It’s based on an idea my daughter had and because it’s fantasy anything could happen. I never would have come up with it myself and that was a blast. 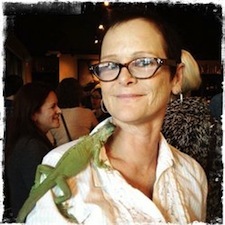 In my fourth book, The Care & Feeding of Exotic Pets, there is a 7-foot iguana named Cookie. I wrote a whole chapter from Cookie’s point of view. It didn’t make it into the book, but I loved writing from an iguana’s mind. I love Cookie and his odd, kidnapping, murderous owner, Oren, too. I write in my teeny tiny office in a corner of the garage. I don’t write in coffee shops – I’m too easily distracted watching the people and making up stories about them. I had one book with a big publisher and it was not a good experience. I prefer a small press where I get personalized attention. I admire people who self-publish, but I don’t think I could do it myself. I’m not a salesman, I don’t have the confidence to push my own work. My son said he didn’t like reading my books because he didn’t like “being in my head.” I guess I write a little bit like I talk and that’s weird for him. My daughter and my husband are fans, but I don’t know if they’d tell me if they weren’t. My first book was about a character with only a sister and my brother called me up and asked why he wasn’t in the book. I told him it was fiction! But he asks every time so I think I really need to write a book with a brother. I love to hike and I really love to read. Unfortunately, I don’t like to listen to books. Too bad because that way I could hike and “read” at the same time. Practice, practice, practice! That’s my biggest advice. Don’t think about writing the perfect short story or publishing or anything, just write what you see and what you think and what interests you. Practice. My favorite book is The Portrait of a Lady by Henry James. I re-read it often. I think re-reading a book teaches so much. When I was young I read all the fantasies by E. Nesbitt. She wrote in the early 1900’s, fantastical fiction about British children chasing magic and getting into scrapes. Reading any good book inspires me – and sometimes intimidates me, which only makes me want to try it myself. I’m still practicing! I’m working on a mystery about a dog catcher. There are so many! The smell of popcorn; my dog scratching her nose; watching my son watch sports on TV (he gets so amped); a cool breeze; clouds in the sky (don’t have them very often in LA) and rain! Rain would make me laugh out loud. The drought: it’s bad and many of the trees in my park are dying. Politics: it’s okay to have different ideas, but not to use them to hate each other. Guns. Violence. When a woman can’t walk around or go to a party or have a cocktail and be safe. And, on a lighter note, I’m sad when I finish reading a really good book. Morocco. From the pictures I’ve seen it is incredibly different from Los Angeles. I imagine Marrakech smells of spices and strong coffee and sand and sweat and camel dung. That would be inspiring! Thanks so much for being with us today, Diana!